For Peculiar Crimes Unit fans this is a sweet short story for holiday reading. True to the series tradition of filling us in on true facts about real places, Bryant reminisced about going to Gamages Department Store as a child in Holbern Circus at Christmas. Those were the days! To purchase click on me! Another fantastic Christopher Fowler Book! In this one we get to ‘ride’ through the history, myths and legends of the London Underground. Full of twists and turns, not to mention the dark, damp tunnels that go no where under London and throw in our wonderfully quirky group of detectives from the PCU and your in for a wild ride! One again the Peculiar Crimes Unit is being threatened with being disbanded, shut-down- you guys are through, but what else is new there? They have been moved to another building, an old warehouse that use to be occupied by a satanic group. While moving in a murderer, Mr. Fox, manages to escape a locked room and kill one of their own men. Now they have been given 1 week to find Mr. Fox or be shut down. Mr. Fox is somewhat of an enigma. He leaves no traces of himself or clues. He is a master of disguise so no one really knows what he looks like and since they can’t seem to find out anything about him they can’t get a profile on what makes him kill. They do know he is particularly fond of the Underground. Of course Arthur Bryant has books full of interesting facts and history on the Underground so while he drags out his old books and moseys around the underground seemingly getting no where, the rest of the crew are trying desperately to find some kind of clue to go on. Bryant’s partner John Mays is getting a little upset with him thinking he is wasting good time with all his history nonsense, but by now we know his book nonsense is what usually breaks the case for them. 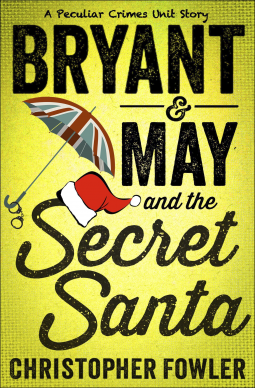 Bryant seems to me to be the British version of our Columbo! In their search for Mr. Fox they discover a new mystery as bizarre as anything they’ve faced yet. A sticker on the back of a young woman who fell down (or was she pushed?) the escalator in the Underground leads them to a local pub and to a group of college students that live together. They seem to be hiding something and more and more clues are leading to them. 3 deaths and one near death – are they linked to Mr. Fox? Are they linked to each other at all? What have the college students got to do with them? Will they find what makes Mr. Fox kill? Can the info Bryant finds in his old history books and from the Underground workers he questions help them? Will he and May find anything when they find a guide and descend down into the world of the dark and scary London Underground to search the miles of closed and dead-end tunnels running under London? I really enjoyed this story! I would give it a 5 out of 5 stars. Your never disappointed with a Christopher Fowler yarn! “Murder doesn’t get more peculiar than this. A lonely hearts killer is targeting middle-aged women at some of England’s most well-known pubs. What’s even more peculiar, Arthur Bryant happened to see the latest victim only moments before her death—at a pub torn down eighty years ago! It’s only the beginning of a case littered with clues that defy everything the veteran detectives know about the profiles of serial killers and the methodology of crime. I loved everyone of these quirky detectives – Bryant – getting old and forgetful, hopes he can remember the info he digs up until he can tell someone else in the dept. Mays – He just found out he has a tumor on the wall of his heart and needs surgery, his life is Bryant and the Crimes Unit and if its closing down then he doesn’t really need to live. Janice Longbright – Just one of the guys in heels, her youth passed her by while she was busy catching criminals. She smokes like a chimney and still looks at the internet dating sites thinking someone out there has to enjoy catching crooks as much as her. Colin, whose dad was a crimes unit detective before him has inherited the same disorder his dad had, DSA, Diminished Spatial Awareness, so he falls off curbs, runs into light poles, misjudges doors. Makes everyone nervous when he’s on a rooftop! Meers, the tough girl from the estates trying to make a difference. And last but not least Dan Banbury, the nerdy computer whiz. These guys and gals bumble through and somehow manage to solve the crimes no one else can. I give this one 5 of 5 stars. It had it all. I can’t wait to read all of the books in the series!